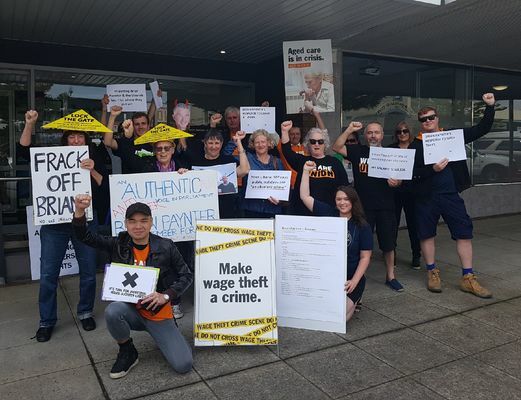 A group of local union activists from the sprawling electorate of Bass held a protest outside Brian Paynter MP’s office on Thursday 1 October. Wielding a giant mock resume for Brian Paynter and the Liberal party, the activists were calling on Mr Paynter to prove his fitness for the role as MP for Bass after the state election. The group also delivered a stack of petition names from voters within the Bass electorate, collected over the last seven months. The 2581 names represented people who had pledged to vote at the upcoming state election based on the issues of wage theft, industrial manslaughter, education, and aged care. The local unionists took issue with Mr Paynter’s stance on penalty rates and public holidays, claiming he had previously called the Easter Sunday public holiday an “absolute crime” and spoken of public holiday rates for retail and hospitality workers being too high. 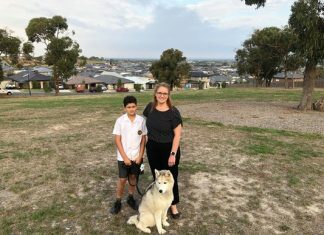 Jack Garton from Cape Woolamai said he hoped locals were paying attention to Mr Paynter’s silence on issues that matter to locals. “Wage theft has affected me personally, and from my conversations with locals it’s an issue that lots of people in this electorate care about. It’s about justice for working people who are being exploited,” Mr Garton said. “The Liberal Party has been absolutely silent on this issue and it’s not good enough – Mr Paynter needs to justify his silence”. Campaign organiser Claire Boland from the Victorian Trades Hall Council admitted that no effort has been made to contact Mr Paynter about the issues. “We haven’t met with Brian and we have made an effort to,” she said. The Bass MP was not concerned about the protest, saying the group was more interested in “grandstanding” than the issues protested. “Instead of protesting they could give me the courtesy of a phone call or a meeting,” Mr Paynter said. “They’re more focused on publicity and grandstanding than dealing with the issues they are protesting about. Mr Paynter said the petition doesn’t contain any surnames, addresses or signatures. He also said the issues were largely of federal concern. “Wage theft, industry manslaughter and education are all federal matters, why would I be speaking out on these issues?